NEW YORK (WABC) -- Daniel Murphy has emerged as a sensation for the New York Mets during the team's run to the World Series. Murphy has hit seven home runs during the postseason, including homers in six consecutive games, a major league record. 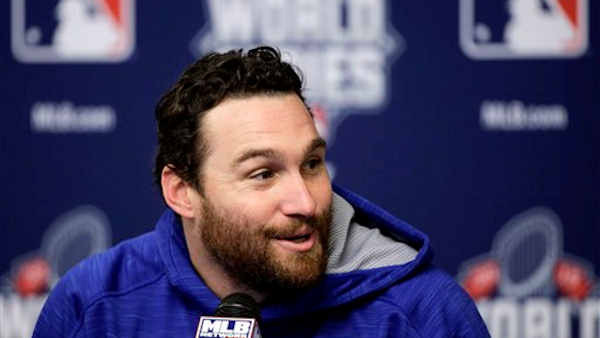 1) Daniel Murphy grew up in Jacksonville, Florida, played high school baseball at Jacksonville's Englewood High School and then played at Jacksonville University, the only college to offer him a scholarship. 2) At age 11, Daniel was asked what he wanted to be when he grew up, as part of his school yearbook photo. He said "Insurance Person", explaining later that his mother worked in insurance and it was all he could think of to say at the time. 3) Since being called up to the Mets in 2008, Murphy has played a number of positions, including left field, third base and first base, but since 2012, he has found a home as the team's starting second baseman. 4) When Murphy steps up to the plate at Citi Field, the theme song played at the ballpark is "I'm Shipping Up to Boston", by the Dropkick Murphys. 5) In 2014, Murphy missed the first two games of the season to be with his wife Tori for the birth of his son Noah. He was criticized by some members of the media for missing the games, but said he never regretted his decision. Two months later, he spoke at a Working Families Summit at the White House about being a working father and parental rights. 6) After the season, Murphy will be eligible to become a free agent. The Mets have the option of making him a one-year qualifying offer of $15.8 million, which could land them a draft pick as compensation if he leaves. Multiple reports indicate the team is leaning toward making him the offer. 7) Entering the World Series, Murphy is hitting .421 in the postseason, with seven home runs, 11 RBIs, and 11 runs scored, and has joined Lou Gehrig as the only players with seven straight postseason games with a hit, a run and an RBI.